The 11th stage in the Giro d'Italia is played out on a hilly route of 156 kilometres. Running from Assisi to Osimo, the race moves through Filottrano in honour of its former resident, the late Michele Scarponi. The finale is a feast for punchers. It’s been six years that the Giro last visited Assisi. In 2012, Joaquim Rodríguez took a stage win in the birthplace of St. Francis, the founder of the Franciscans, a religious order that rejects extravagance. One may wonder what the preacher would have made of the pink circus. Twice before the Giro finished in Osimo. In 1987 the forgotten French rider Robert Forest took his only major victory, while Moreno Argentin won in 1994. Both were solo-wins and given the tricky finale this is a likely scenario in 2018, too. 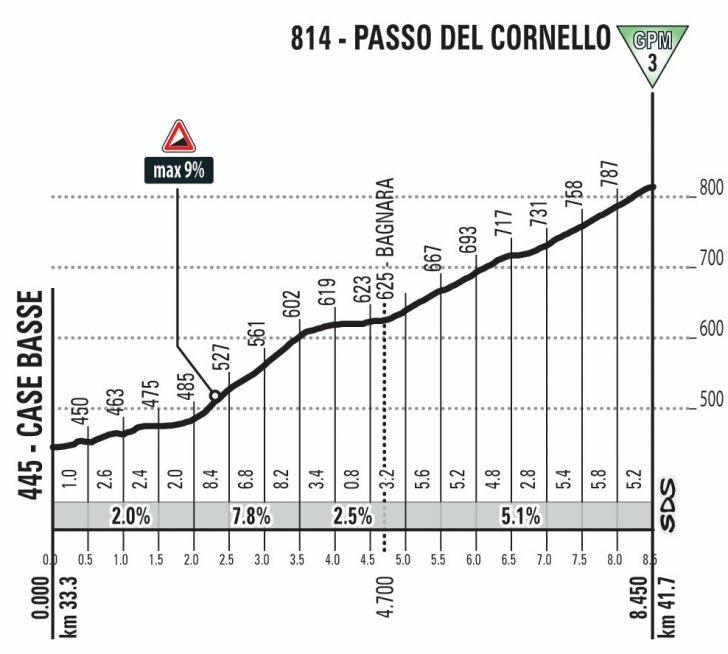 Following a flat and then slightly climbing 30 kilometres the riders tackle the Passo del Cornello. To arrive at the peak (814 metres) the road climbs for 8.5 kilometres at an average gradient of 4.4%. The route drops to Molinaccio Umbro and after a short uphill section a false flat of some 40 kilometres runs to the base of the Valico di Pietra Rossa. After almost 100 kilometres, the climb peaks at an elevation of 674 metres. now the caravan moves further east. Almost 30 kilometres left to race, mostly on rolling roads until the finale kicks in with 10 kilometres to go. To stretch the muscles the riders tackle a 700 metres climb at 9% before heading to the final round in Osimo. The medieval town ushers in the Giro on a cobbled ramp of 250 metres with its steepest stretch at a whooping 16%. The riders fly down a tricky drop and following a narrow section the route climbs up Via Olimpia – 600 metres and averaging 12.4%. Positioning is crucial. Via Olimpia continues onto a flat section to a narrow passage into the old town. 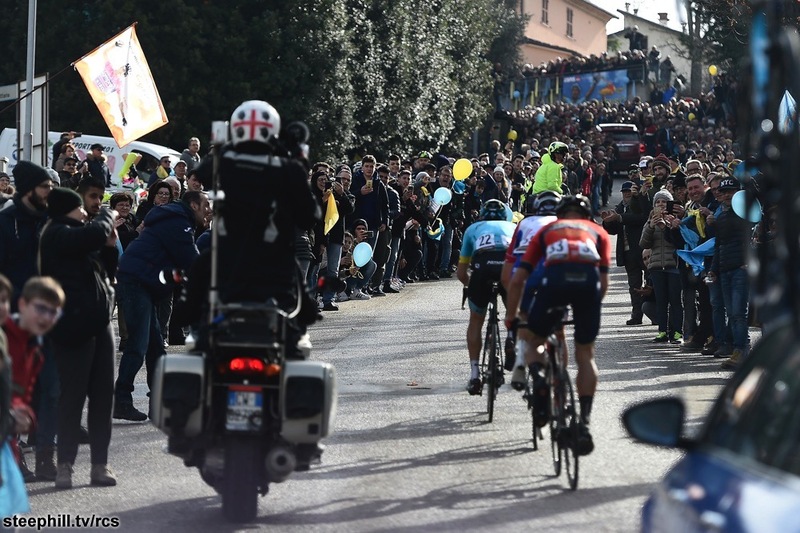 A cobbled climb of 600 metres at 10% leads to the final 400 metres before the finish is at Piazza del Comune. Fourteen years ago Moreno Argentin left the other riders behind on the last cobbles to arrive solo at the Piazza. He not only took the stage win, but also the maglia rossa. Since then local tifosi call this stretch the ‘scatto Argentin’. Assisi, on the north-western side of Mount Subasio, slightly higher than the northern Umbria’s valley, is located at approx. 26 km south-east of Perugia. 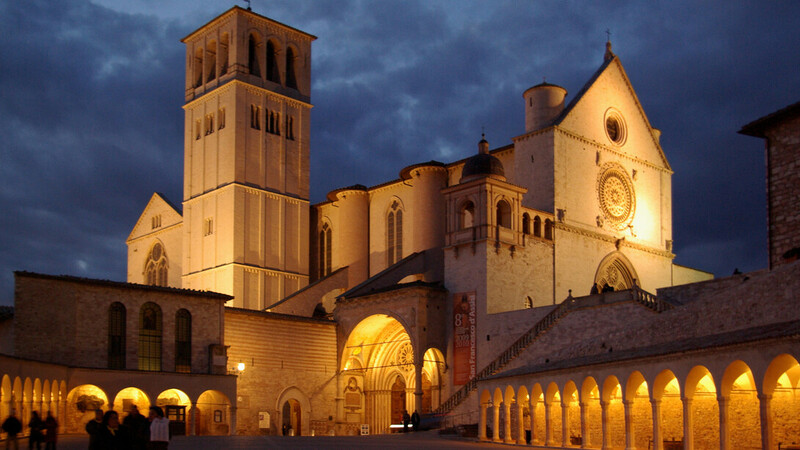 It is known as the city of birth and death of st. Francis, patron saint of Italy, and st. Clare. Basilica di San Francesco (Upper and Lower church, UNESCO World Heritage, 13th century), Basilica di Santa Chiara (13th century), Roman amphitheatre (1st century), Temple of Minerva (1st century B.C. ), Rocca maggiore (14th century), Piazza del Comune. 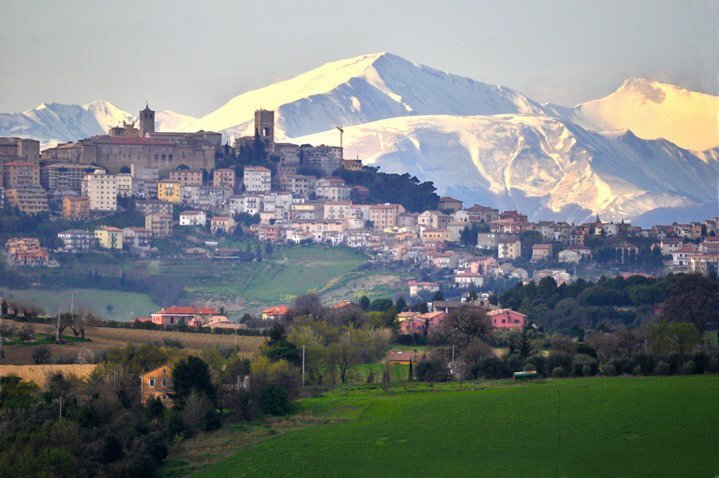 Perched on a peak at an altitude of 265 m, Osimo stands in a hilly landscape. Its historical centre stands on two hills, of which the highest one – with the cathedral – is called Gòmero. The Romans, since the III century BC, turned it into a major colony and built the strong walls (174-175 BC) that are still a unique landmark in the Marche, as well as a fountain, Fonte Magna, the name of which is attributed to Pompeo Magno’s arrival to Osimo during the civil war against Cesar. Cattedrale di San Leopardo (5th century), Concattedrale di Osimo (13th century), Santuario della Madonna di Campocavallo (19th century), the caves of Osimo, Teatro La Nuova Fenice (19th century). After all the hard work everybody did on yesterday's stage (10), today could bring more changes in GC. 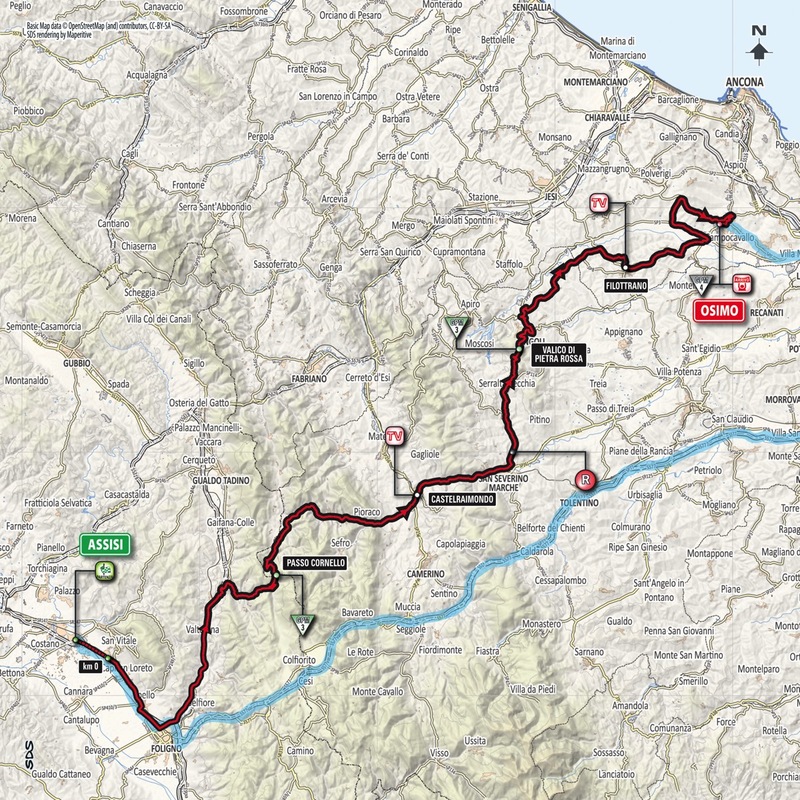 This could become one of the most tactical Giro's in a long time - IF the riders take chances today - and make them work. 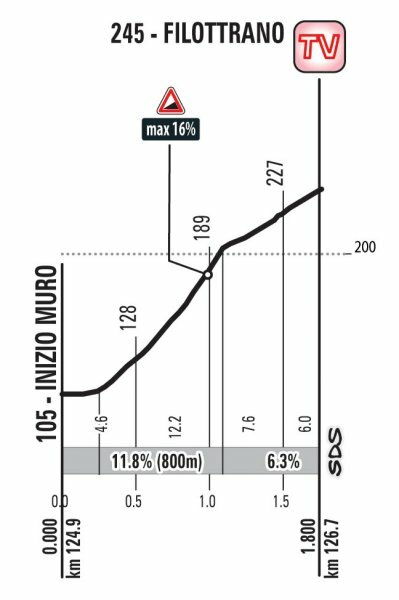 If It's all together at the bottom of that final climb to Osmio from what we've seen so far this race there is only one winner. Although I've now had a bet on him to win so that's probably his chances scuppered. Ah but I didn't bet on him so the impact on the race outcome due to strangers' random transactions has been massively reduced. Before yesterday's slog for half the team, this was nailed on for Yates because firstly, he had targeted it pre-race, secondly the current tactic seems to be to nickel & dime, as the Americans say using bonuses, thirdly they have the team to control a difficult stage, or did until yesterday. it could be a good finish for Yates indeed, but after yesterday's stage, I'm not so sure anymore any team is willing to spend more strength than absolutely necessary. All the flatland domestiques were riding full out for Chaves yesterday, Wellens said he doesn't feel particularly well, so we can't expect much from Lotto either I guess, and what they call "team work" at Lotto Jumbo seems to mean celebrating together at the finish, in case Battaglin finishes it off himself. I have added 5 star Simon Yates and also forgotten, 4 star Michael Woods to the favs for the stage list. Not sure when a proper break is going to go all the way. Ding ding ding! We have a winner! At least, based on the results, it looks like you got this part right, too! I have yet to watch the stage broadcast - just finish clip. About what I expected from Yates, better than I expected from Tom. Notably nobody else there in the last km except those two. You know, I do have to say Yates' climbing performance to date has been nothing short of dominant. So far, he really looks like he could be the maglia rosa in Rome. And his confidence has been nothing short of cocky. Ok then! I don't track results in my head, but it sure seems to me that we've been hearing plaudits for the Yate bros for some time now. And then we keep hearing they had a bad day, and ooops. Who thinks that THIS Simon Yates is THE Simon Yates we can expect to see for the rest of the Giro, and in the future? Of course he can pull off the win on this Giro -- but is he a one-Giro man? Or is he a top level GC contender in the making? I'm still rooting for Tom. In that case, I think you had better watch the stage broadcast. Search was referring to teams chasing down the break, thus bringing the GC boys and Yates into play. Under three and a half hours to cover almost 160kms of very lumpy terrain should give you a clue. yeah, Lotto, Jumbo and Trek did a lot of chasing for their guys to finish 16th, 19th and 24th. there seems to be no improvement in sight for Chris Froome by the way, losing another 40 seconds today. Getting caught out when Stybar/Wellens attacked and ending up in the 2nd group going into the final climb was of no help of course - but the same applied for Betancur, Lopez (both +30s at the finish), Oomen, Battaglin, Bilbao and O'Connor (+36s), all finishing ahead of him. Froome - nearly getting to the point where he cant come back from some of those guys ... and definitely not to Dumoulin. Ok, MV, I watched the stage from about 80km out. Yup - I can see the teams worked harder than they wanted to - but not as hard as they could have. So we had a few teams - out of the GC battle - willing to push the pace. Hmmmm, interesting. AG's estimation is pretty good in my thinking. I am not as optimistic for Dumoulin as AG, but it is a close thing. I am not as pessimistic regarding Froome as AG, either. * Dumoulin is solid over 3 weeks - that is proven. However, while he may be a "climber", he is a bigger, heavier rider than the "climbers", and both Froome and Yates likely have an advantage on him on the real climbs. * Yates is picking up seconds, and bonus seconds, using late accelerations. Well-timed, and amazingly strong - but he isn't really gaining time on the CLIMB - he is gaining late seconds by being able to accelerate late in a climb. Contador had a similar talent, but on the big climbs, it would frequently be smothered by other riders taking their pace and working their way back. The result is that I am not convinced we know the Giro winner yet. I could go with a bet on either Yates or Dumoulin. Froome is, at this point, a dark horse, but a good bet as the underdog. When two riders from lower division Italian teams riding on a wildcard invitation here; Mirco Maestri (Bardiani CSF) and Fausto Masnada (Androni-Giocattoli) went after them to make four up front, there was a lull in the peloton and everyone seemed happy enough to call a truce, especially with another 8km of climbing to go. With the peloton fanned out across the road # everyone settling into the day, there was a bit of arguing and gesturing going on at the front of the bunch before suddenly one of the Wilier Triestina guys Alex Turrin jumped clear and went after the four leaders. My Spanish team-mate Fran Ventoso was riding in the second line at the time and told me afterwards that Turrin, probably under orders from his team manager to get up the road today or face the consequences, had pleaded his case with WorldTour compatriot Giovanni Visconti of Bahrain-Merida. After much hand waving, looking around and gesturing as if to say ‘Okay lads, let him go. But this is the last one,’ Visconti moved over, Turrin was allowed through to the front and set off in chase. Often at the Giro, the smaller Italian teams have their own battle going on and one can’t be seen to be in the break and getting valuable TV time without the other. I’ve seen managers make their teams ride on the front for the rest of the day as punishment for missing the break. Turrin eventually got across to the other four about 10km later but the quintet weren’t given the lead I had been expecting. In it interesting to compare the state of play with this time, last year. One ITT done, Dumoulin had a lead of almost two and a half minutes over the field. There were 6 mountain stages and 29kms of time trialing left. This year, there are 5 mountain stages and 34kms of time trialing left. As for the Zoncolan the only pointer we have to hand can be found in the 2015, when those three, plus Lopez, Chaves, Henao and Gesink battled it out on the climb that probably most resembles the Italian monster: stage 5 of the 2015 Tour de Suisse and the Rettenbachferner. backstage pass for yesterday's stage. aa'ight, then, no link? Make me do my own work, eh? A bit earlier in the climb. More of Tom D here. Tom ended up winning by half a minute but did have a couple of incidents in the final week which cost him time, maybe a couple of minutes. So one could argue that if you are comparing the two years it is best to assume there was little net change from the position above to the final GC. So if Yates is as good as Quintana was in the last week of 2017 and Dumoulin is as good as Dumoulin was, Yates wins. Just.